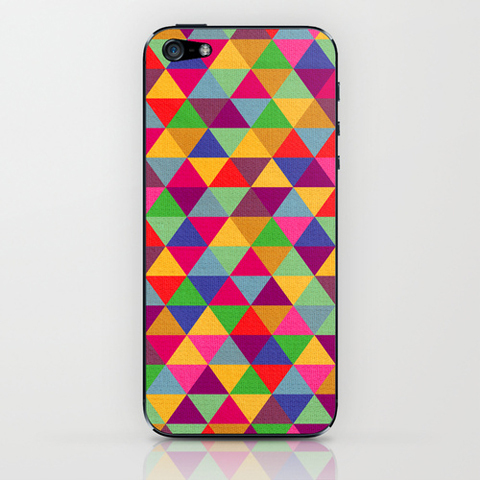 In Love With iphone cover by Bianca Green. 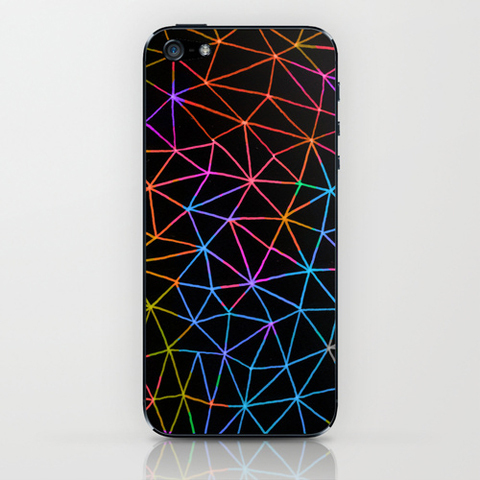 This neon abstract Geometric Glow is by Fimbis. 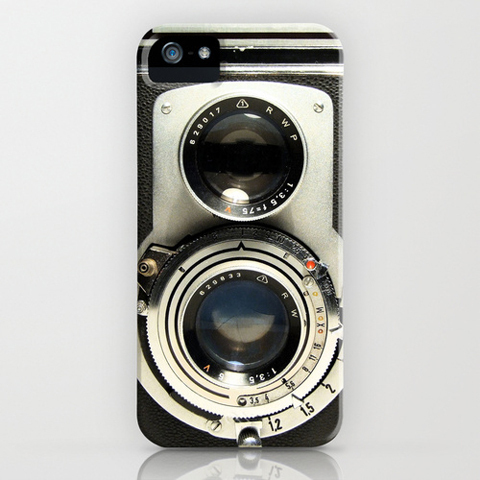 The fake vintage camera is a perennially good look – particularly fun if you are into self portraits as the cover design will register in the mirror! By Ewan Arnold. 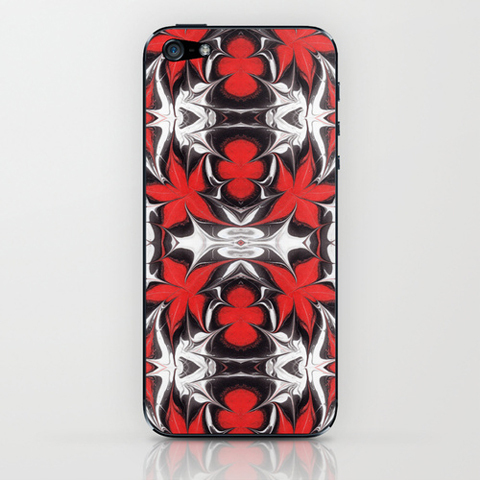 I think the most unusual has to be this iphone cover by textile designer Kate Hasted, inspired by Japanese flowers. 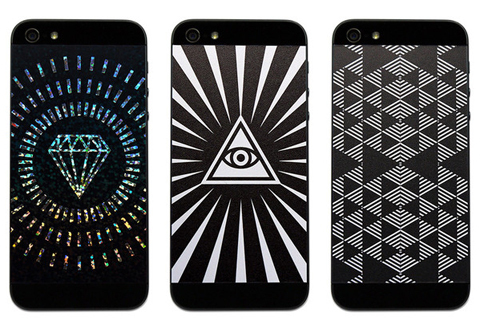 For iphone 5 users why not take a look at these new vinyl backs with bold optical designs by Phone Pop? 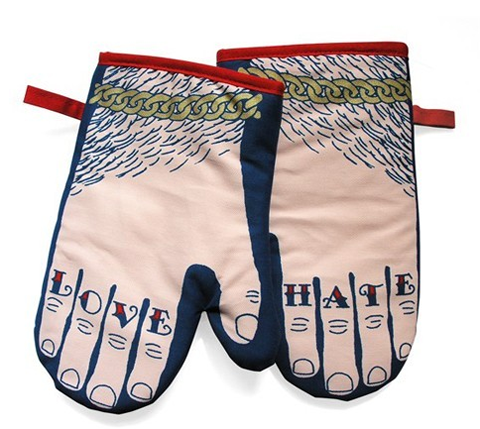 If the man you are buying for loves cooking why not surprise him with these fab Glove and Hate oven gloves? They come complete with hairy wrists and chunky gold bracelet: by Stuart Gardiner at Howkapow? 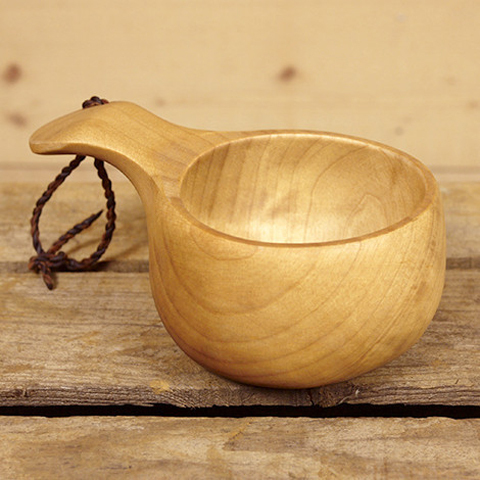 And those who like camping: what about this Kuksa outdoor wooden cup of traditional Sami design, available on new website The Brokedown Palace. A great place to find the perfect present for those who love the great outdoors. 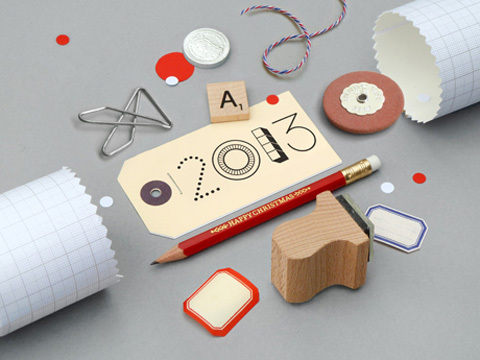 Does your man love nice stationery? 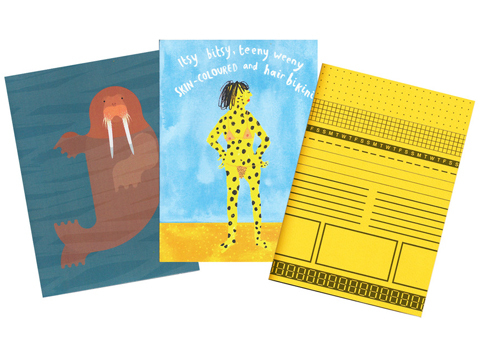 I adore these illustrated notebooks (including one by contributor Lorna Scobie) from Dereks Shop. 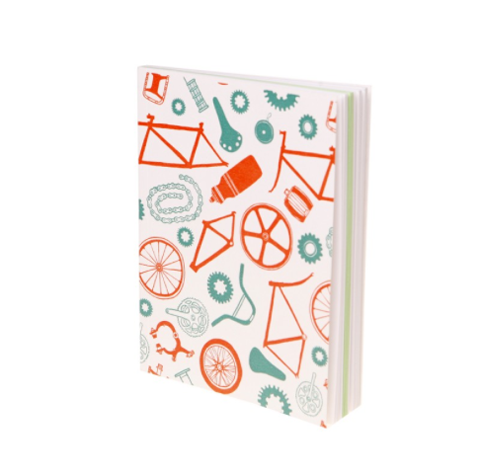 Or if your man is a bike lover, how about this Bike Parts notebook, by Luke James for Noodoll, available on Soma Gallery. 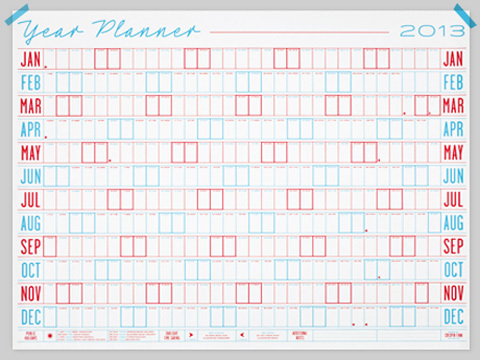 This fab 2013 Wall Planner is from Present and Correct, the most fantastic website for all graphic design and stationery buffs. They also do an ‘Office in a Christmas Cracker‘ which is beautifully put together. 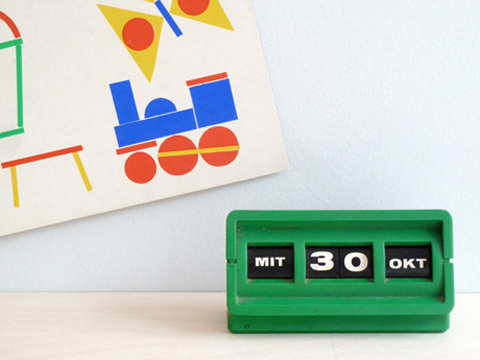 And to sit on the table, a vintage rolling plastic calendar. Does he like collectibles? 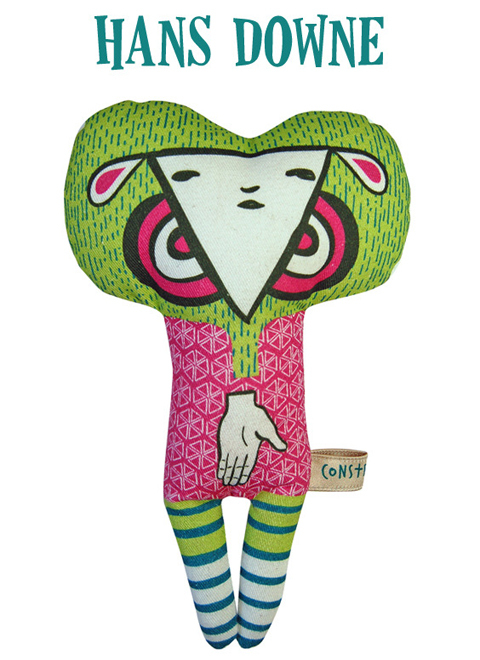 If so how about this fantastic plush toy by Craig Yamey for Constructive Studio? Hans Downe is part of the limited edition Yam Kids range: strange creatures all. 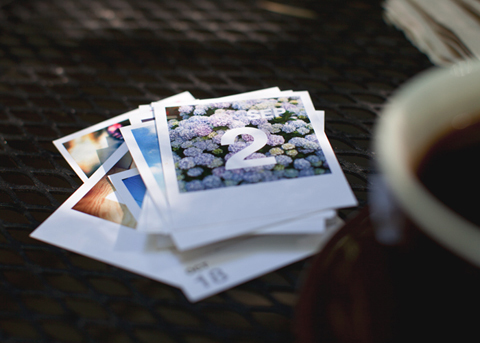 On a more personalised tangent – if you’ve got the time and you’re a social media nut nut like myself, why not make an instagram calendar with printstagram? If you don’t have time to edit you can just stream the photos off your phone and bung them all in! 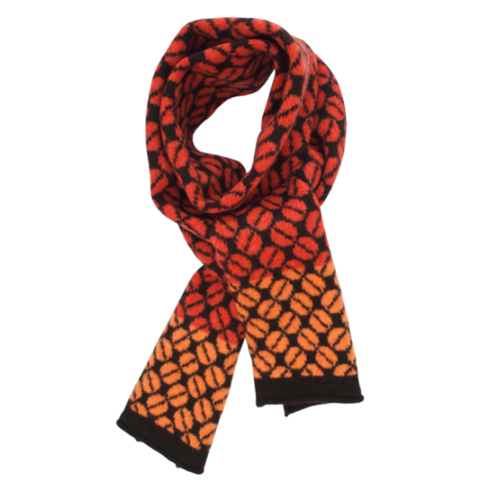 Moving on to clothing: I adore this lambswool scarf by Seven Gauge Studios on Two Red Trees. 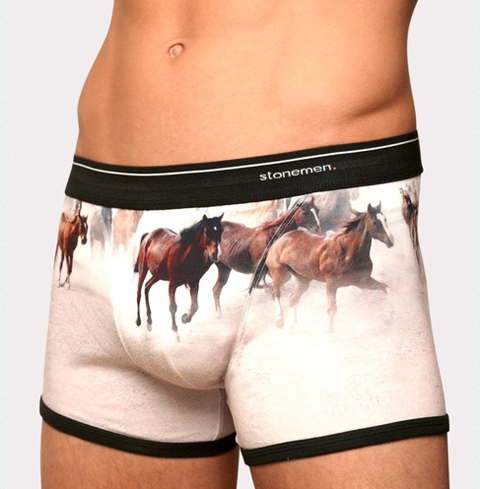 Or if you prefer something with a bit more humour – how about these brilliant boxer shorts with wild horses stampeding all over them? By Rob Yelling for Stonemen. 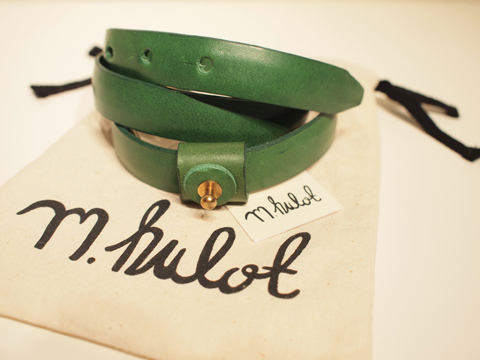 This beautiful handmade Skinny Rhodesia leather belt is by M.Hulot and it is available on Dereks Shop. 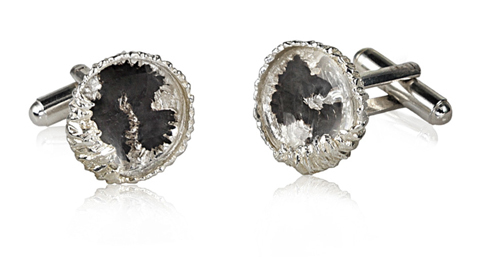 For jewellery I am particularly taken by Niza Huang‘s petroleum cufflinks – inspired by the preciousness of ‘black gold‘. 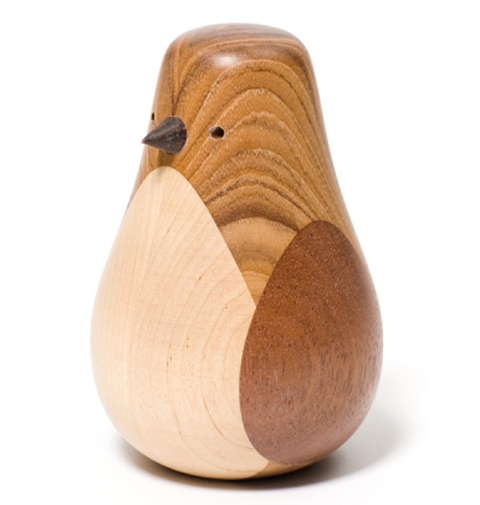 As far as beautiful objects go, I love these re-turned wooden birds created from scrap wood by Finnish designer Lars-Beller Fjetland on The Lollipop Shoppe. 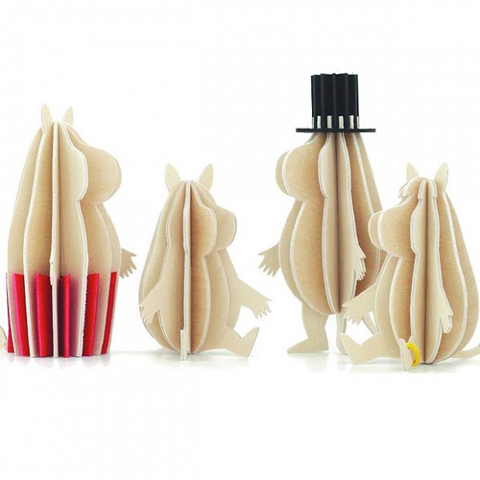 Maybe he remembers the Moomins? Then this birch ply family by Lovi on Hus and Hem is just the ticket. Does your man hanker after a pet? 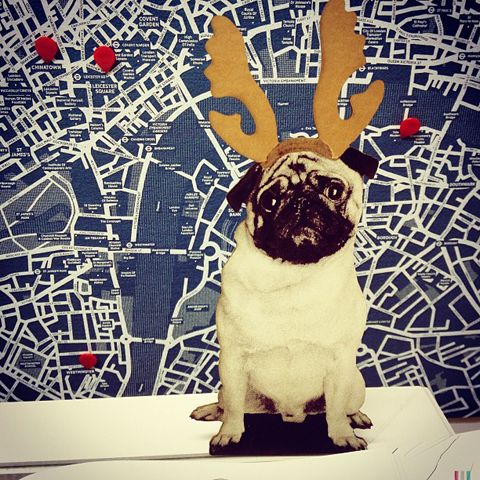 If he’s as dotty for pugs as mine then he’ll love this festive specimen bearing Christmas antlers by Garudio Studiage. 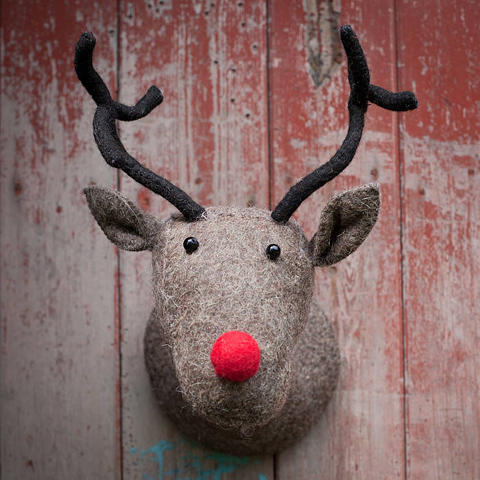 Or he might prefer this ace felted reindeer head by Armstrong Ward on Not on the High Street. 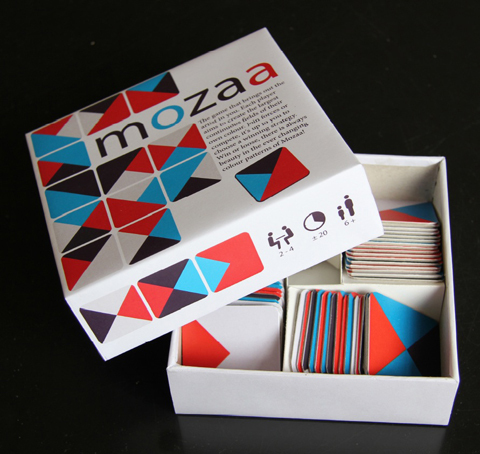 Finally – if he’s into games how about Mozaa, a colourful combination of puzzle and mosaic, bound to be loved by all design fiends. 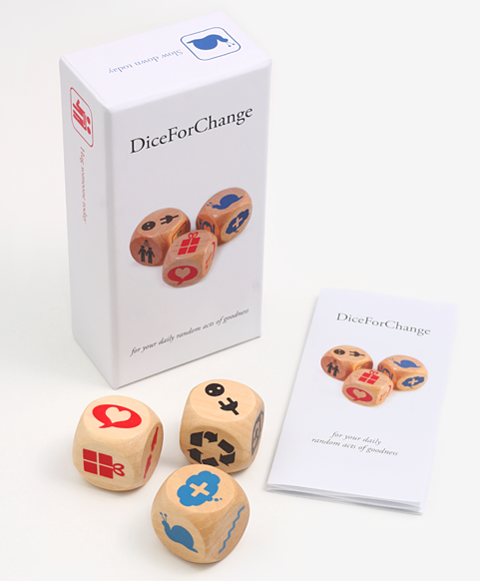 And in 2013 maybe he’ll fancy playing with his Dice for Change: featuring beautifully designed pictograms to inspire daily random acts of kindness. Christmas Gift Ideas 2012: Cushions!